British yachting owes a much deeper debt to His Majesty King Edward than that incurred through ordinary royal patronage, for in him it can boast an active participant in the sport. 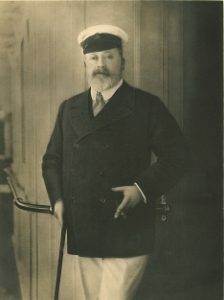 The King has always been fond of the sea, and in his early days he received a sound yachting tuition, in the 37-ton Dagmar, from Lord Alfred Paget. He frequently raced on the crack yachts of the day, such as Mr. T. Chamberlayne’s Arrow and Count Edmund Batthyany’s Kriemhilda. Before entering the lists himself, he owned the steam yachts Princess and Zenobia, and in 1876 he purchased the fine schooner winning the Cowes Town Cup in that year. He also sailed a private match this year with his future schooner Aline, 2 15 tons, then the property of the Earl of Hardwicke ; but Hildegarde was obliged to give up, the wind being very paltry and Aline carrying huge balloon sails. In 1880 he purchased the celebrated cutter Formosa, but at this date the tonnage rule was quickly destroying the chances of the older yachts. His Majesty’s greatest boon to yachting came in 1893, when he brought out the famous Britannia. First-class racing was practically dead before this, but a better class was never seen than that in which Britannia competed. A splendid type of sea-going vessel, she created a racing record which it would be difficult to equal. Her racing, also, against the American cutter Vigilant will long be remembered by yachtsmen who witnessed it. Britannia was an absolutely reliable vessel. One could on all occasions feel certain that she would show at her best, whereas most yachts have a tendency to like some particular condition of sea or wind better than others. She was wisely selected to defend the Royal Victoria Gold Cup, the Cape May and the Brenton Reef Cups. During her first five seasons Britannia started in 219 races and won 147 prizes, the total value amounting to £10,000. His Majesty has taken considerable interest in the repeated efforts of Sir Thomas Lipton to regain the America Cup, and has frequently inspected the challengers. He had just arrived on board Shamrock II on the Solent when she carried away her mast, fortunately without injury to anyone on board. Victoria and Albert. S.Y., 5,005 tons. His Majesty the King. 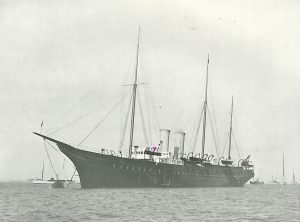 The King’s yacht Victoria and Albert was completed for His Majesty in 1899 at Pembroke Dockyard. She is a superb vessel of 5,000 tons and 11,000 horse-power. Considerable alterations were necessary after she was launched, but she is now a splendid sea-boat and a stately-looking ship. Noting the merits of the turbine type of machinery, His Majesty, in 1906, ordered a new yacht of 2,000 tons to be built for use when short voyages are contemplated. The order was entrusted to Messrs. Inglis, and the vessel is named Alexandra, in compliment to Her Majesty the Queen. His Majesty, as Prince of Wales, became Commodore of the Royal Thames Yacht Club in 1874, and in 1881 he accepted the Presidency of the Yacht Racing Association, his identification with that body being of the utmost service in giving it the authoritative standing which it now enjoys. In 1882 he accepted the office of Commodore of the Royal Yacht Squadron, of which he has been a member since 1863. This position he held until his accession, when he resigned all such offices, but retained his connection with the Squadron as its Admiral. Following the custom of Queen Victoria, His Majesty has presented four Cups to various yacht clubs annually, one always being given to the Royal Yacht Squadron. It should be noted that these are the personal gifts of the King, and are not in the nature of State donations.